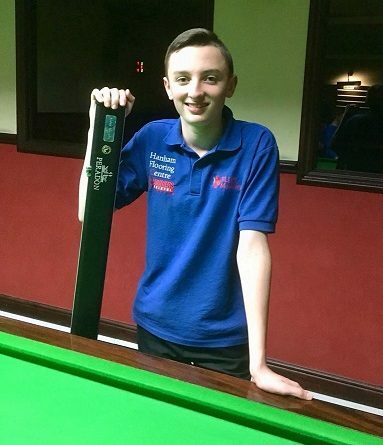 BRISTOL’S talented young snooker player Aidan Murphy has taken a giant step towards earning promotion to the national junior circuit. And as further proof of his continued improvement, the 14-year-old has increased his highest break in competition to 119. Murphy won the first leg of the Midlands section of the EASB Regional Junior Tour without dropping a single frame. Subject to official confirmation, the top two in the rankings at the end of the six-leg circuit will earn automatic promotion to the Regency Pro Tips Premier Junior Tour, which is restricted to the top-32 under-21s in the country. The teenager won all four round-robin group matches at the Midlands Snooker Academy, Walsall. He then beat Joe Woodhouse (Walsall) 2-0 in the last-eight, recorded the tournament’s highest break of 72 in a 2-0 semi-final victory over Halim Hussain (Birmingham) and overcame Bradley Harrison (Nuneaton) 2-0 in the final to collect £50 prize money. A shorter trip to Jesters Snooker Club, Swindon, resulted in a new high break for the budding star who is sponsored by Elite Mobility. Hanham Flooring Centre and NH Couriers. Murphy cleared the table for a 119 in a 2-1 victory over former England international Haydon Pinhey (Plymouth) in the West of England Snooker Open. Despite winning four of his seven matches, he missed out on qualifying for the quarter-finals on frames difference.